We would like to introduce an exciting new "Exclusive Tour" in North West Auckland. This is a family run operation providing an exceptional addition to any tour group excursions visiting Auckland. We are situated in Muriwai Valley on a 10 acre farm set in a stunning back drop of fabulous rolling countryside and a 5 minute drive from the renowned Gannet Colony at Muriwai Beach. We pride ourselves on our presentation and high quality of Gardens and Miniature Horses. 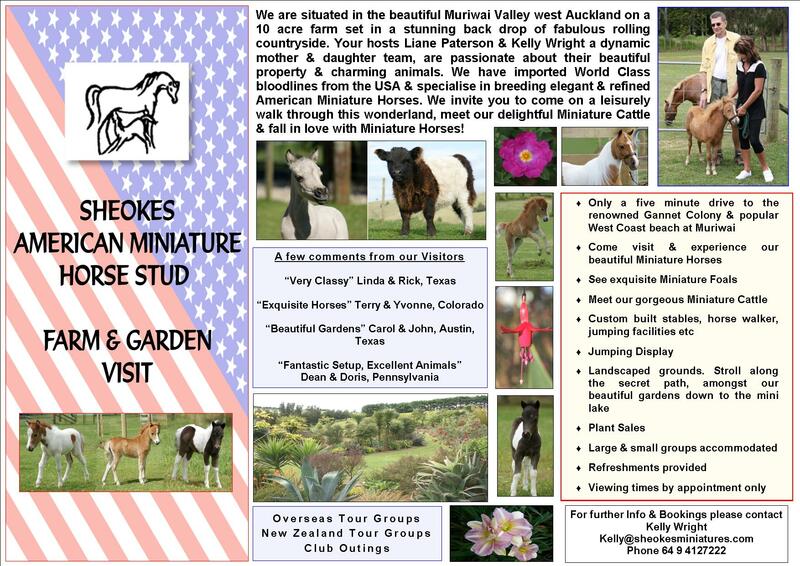 Liane has been breeding, showing and training Miniature Horses for 18 years and is one of New Zealand's premier Miniature Horse breeders having imported World Class bloodlines from the USA and specialises in breeding elegant and refined American Miniature Horses with outstanding pedigrees. Our guests are treated to a great hands-on session with our beautiful Miniature Horses and demonstrations of what we do which includes Miniature Horse Show Jumping! Adorable foals are due from October ... so be prepared to fall in LOVE! You won't want to miss meeting the latest addition to the farm, the delightful Miniature Belted Galloway heifer "Millie Moo". A delicious homemade morning or afternoon tea is provided and an opportunity to experience hand feeding the farm animals as we make our way around the property. An avid gardener, Liane has transformed the gentle contour of bare farmland to create a mini lake that is surrounded by an intriguing, beautiful large garden incorporating plantings of native trees, palms, a huge variety of shrubs, bromeliads and perennials including a colourful array of Day Lilies. We invite you to come on a leisurely walk through this wonderland abundant with birdlife. This tour is a stand out New Zealand experience which is unique to us alone! Bookings are essential with a minimum of 5 guests per group. If you would like to learn more about our unique tour you are welcome to contact us using the form below.